I'm sure at some point in time you have had to pack up your belongings to get ready for a move; well that's exactly what we have been doing while preparing to move materials and displays into the Center School and reorganizing the stone schoolhouse. Since our Woodtick Schoolhouse will still serve as our school history museum I have been rereading much of the school history documentation and stories. This month I'd like to share several interesting stories about these old buildings and stories from the teachers who taught in these schools. In 1770 when the first School Committee was established, they divided the town into nine school districts, but not all districts built a school so some classes were held in private homes. Parents paid for the upkeep of the schools through a tax, which was levied on them. This tax was apportioned to the number of children attending and the number of days in attendance; thus those parents with a "meager purse" could only pay for a limited education. Some parents paid tuition by furnishing wood for the fireplace or by allowing a teacher to board in their home. In 1895 and just out of high school Miss Lilian Carr began her teaching career at the Old Stone Schoolhouse; the following is an excerpt of her recollections in September of that year. "Mr. Henry Carter, a member of the Town School Committee called upon me and persuaded me to accept the position. I had been asked to teach in Prospect the previous winter, but I did not wish to leave high school before graduating. An interview with Mr. John R.S. Todd, Acting School Visitor, was necessary. He gave me a test and then made out a certificate, which stated I was eligible to teach in the schools of Wolcott... I did not wish to be a teacher, but a talk with Mr. Todd apparently changed my mind. Twenty-four- that was about the seating capacity of the school, but that number did not attend at one time. Some had moved away or left before others entered. Their ages ranged from five to fourteen. After the first week the fourteen-year-old boy withdrew and attended school in another town where he could be with pupils of his age. There was a wood-burning stove in the middle of the room. What served as a blackboard I do not remember. It was not smooth so it may have been just the painted wall. The younger students had slates, but I think the older ones used paper and pencil as ink froze in the winter. I have no recollection of textbooks used. From the range in ages I should judge there were at least four grades. The school was in session from nine till four, with probably an hour's intermission at noon and recess mid morning and afternoon. At recess two boys were sent to a neighbor's quite a distance away to get water from the well. We all drank from the tin dipper. On some very stormy days we used to collect snow water dripping from the roof. That was not very successful, besides it tasted smoky. Our lunches were brought in pails." She also stated that she received six dollars a week pay and if you served as janitor they added two dollars a term. She boarded with the Munson family on Munson Road and the fee was three dollars a week or two fifty if she went home on weekends. Sometimes she walked home to Waterbury in the middle of the week because she was homesick. She would take Wolcott Street to Long Hill Road where there was one house and her home was two blocks from the Waterbury Green. Ethel Loring (Somes) taught at the same school from 1925 to 1930, but by this time the school had received an addition to lengthen it. An entryway and wood shed were added, but there was still no inside plumbing just an outside well pump and the two outhouses out behind the building. She wrote, "When I arrived from Perry, Maine at my boarding house, the home of such wonderful folks, Claude and Nellie Badger, it was very dark. I had taken a taxi from the railroad in Waterbury and the five miles seemed endless. I was very young, having only graduated one year before, and even then, had visions of being kidnapped... When I walked over to the little school the following day and saw the stone building, I realized how inadequate I felt being trusted to guide little minds, hopefully in a challenging and inspiring road, carrying on as best I could... I found out that I was to teach all eight grades with about thirty students. A huge wood stove stood in the center, front of the room... The enrollment was at lest three-fourths from foreign descent representing at least six nationalities." She stated that the children attended school to learn and parents cooperated one hundred percent. She played basketball at recess with the girls and welcomed a yellow and white dog that came to school daily with the Boulanger children. 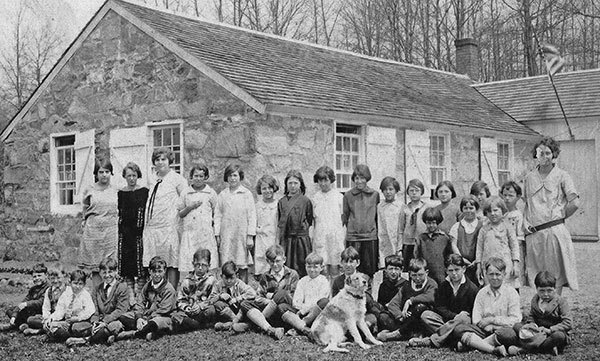 Each year enrollment increased and by 1925 it was into the forties so the class was divided; she taught the lower grades at the school and another class for upper grades was moved to the stone chapel down the road. That summer the new Woodtick School was built. Rita Marie Fitz-Maurice who taught at the old North School told the last story I will share. This school was located on North Street, but at the time she was teaching the road was named School House Road. Rita graduated from Danbury Normal School in 1929, which was a two-year teachers' college. 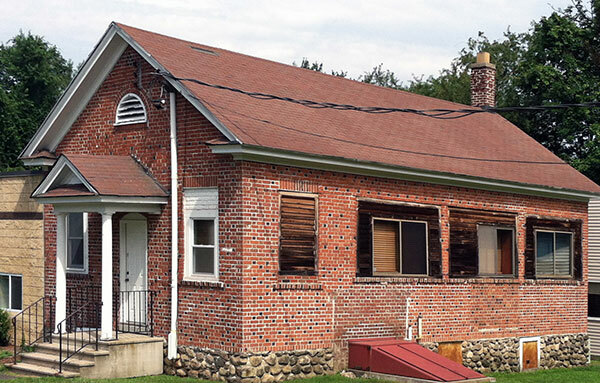 She began teaching in Wolcott in 1932 and boarded at the Rufus Norton dairy farm on Beecher Road. Each morning she was driven to the old North School along with the Norton children and neighbors. These are her recollections. "The entry was interesting. A large glass jug of water on a wooden stand, a long row of hooks for coats and a back door leading to the rear of the building... The pot bellied stove was surrounded by rows of armchair desks on one side indicating seats for grades 1 through 4. On the other side were larger seats for grades 5 through 8. The room was large with three windows on the north side. Between each window were oil lamps (3) fastened to the wall. On the opposite wall was a blackboard. In the front of the room were a teacher's desk, a large clock and a flag on the back wall." Rita went on to share her story of getting to know her twelve students whose family names were Norton, Glowasky, Stryeski, Miller Dieter, and Cutler. Her teaching experience at the old North School was positive and fun to read. She also stated that this was the only building on the road and her nearest neighbor was two miles away at the Miller Farm. There were no telephones or radios and the girls and boys seldom used the outhouses that were out behind the building. Rita said that school nurse and music teacher came once a month, weather permitting and her pay for the school year 1933-34 was $750. These are only excerpts from their teaching experiences, but if you want to read their complete memories you will have to visit our schoolhouse museum once it reopens in the near future. Hope to see you there in the summer. The first North School was located on Schoolhouse Road (North Street) in the northern section of town. It burned in 1928 and the new school was built in the same year. The second North School, which is located on North Street, was built in 1928. This is the school where Rita Marie Fitz-Maurice taught in 1932. 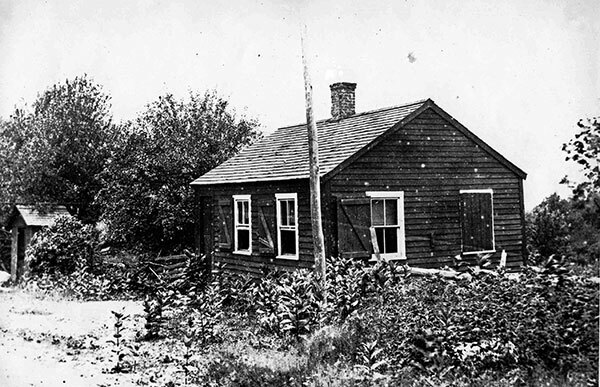 Old Stone Schoolhouse, Nichols Road in September 1895. From left to right- Harry Eastwood, May Norton, Lena Munson, Maurice Alderman, Justine Browne, John Herbst and Rosa Herbst. Two boys in the front row are Aldina Hamel, and Charles Browne. The teacher is Lilian Carr. 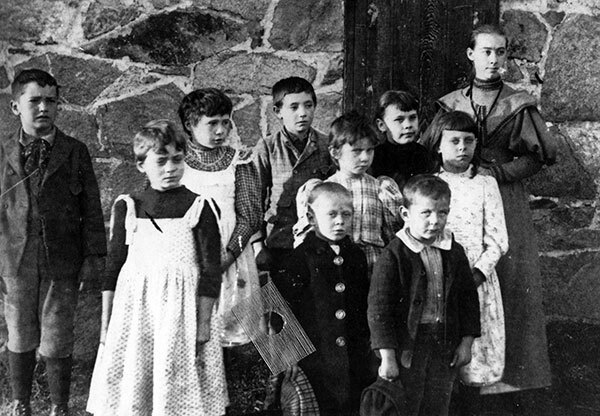 The students attending the old Stone Schoolhouse on Nichols Road, May 9, 1929. Front row from left to right: Edgar Duhaime, Richard Snow, Jesmond Nigro, Charlie Snow, George Goodson, John Knise, Gregory Boulanger, Charles Sharp, Kenneth Garthwaite, Philip Boulanger, Frank Webber, unknown, Andrew Washenko, Judson Towne, unknown. The three in the second row to the right: Thelma Boulanger, Beatrice Nigro, Anna Snow. Rear row: Edith Moss, Helen Garthwaite, Dorothy Moss, Nancy Goodson, Genevieve Garthwaite, Mildred Snow, Mary Rozdilski, unknown, Loretta Nigro, Violet Dingwell, Gertrude Duhaime, Nellie Rozdilski, Mary Garthwaite, unknown, Mrs. Ethel Loring (Somes), teacher. To view past installments of the Historical Society News, click here.